The Northwest Area Foundation (NWAF) granted $525,000 over three years (July 2013 – June 2016) to the Oregon Business Council Charitable Foundation. OBC contracted with Kitchen Table Democracy (formerly the Policy Consensus Initiative) and with ECO Northwest to provide support to the OBC Poverty Reduction Task Force (Poverty TF). For the 2013 annual Business Summit ECO Northwest prepared A Path to Prosperity that emphasized recognizing different groups of people experience poverty differently, having a family-wage job is the best way out of poverty, and it is critical to have an adequate safety net for people who cannot work or are in transition. ECO Northwest continues to provide data and analysis that supports all the efforts of the Poverty Task Force. The Poverty TF has provided advice and support to the Portland Business Alliance’s Partners in Diversity project aimed at identifying strategies to employ more people of color in manufacturing, health services, and skilled trades jobs. An important part of the legislative strategy is to partner with community organizations. During the 2015 session we worked with Children First for Oregon, Neighborhood Partnerships, and Partners for Hunger-Free Oregon. The Urban League and United Way are new partners for the 2017 session. During the 2016 short session the Poverty TF is supporting two bills related to the Earned Income Tax Credit (EITC). One bill is to increase utilization of the EITC, the other is to increase the EITC for families with small children. As part of its work to improve utilization in 2016 the TF worked with PGE, Pacific Corps, NWNG, the Public Power Association, the Rural Electric Co-ops and the Portland Water Bureau to alert their customers to the EITC and how to file their taxes to get that benefit. The Poverty TF has provided testimony to the Oregon Workforce Investment Board and the contacted the Governor with concerns about assuring that low income people benefit from coordination of the workforce and social service systems. In November 2014 the Poverty TF sponsored a Prosperity Design Lab to identify breakthrough innovations to address poverty. 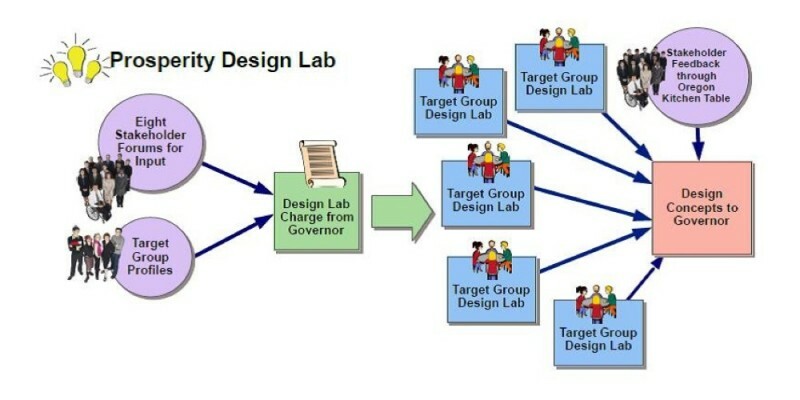 The Design Lab was preceded by eight community meetings around the state to get input from communities. #EveryoneIn: Using the sharing economy to benefit low income people to overcome social isolation and share resources. The United Way of Columbia Willamette is taking the lead on this project which will bring together organizations that serve low income young parents and tech entrepreneurs and innovators in a series of design implementation sessions. Lifelong Prosperity Accounting Tool: Create a consumer–focused approach for people in poverty to identify resources and track progress on their goals. Communities of Concentrated Poverty: Develop ways the state can impact communities with high poverty rates especially in communities of color and rural communities. Consultation with the public: Using Oregon’s Kitchen Table the Poverty TF will seek input from the public about what are the essential components of a strategy to significantly move the dial on poverty. When low-income parents move out of poverty, the positive effects on difficult―for all of the reasons documented in the plethora of recent studies on poverty, inequality, the trauma of social inequity and social mobility. Already stretched social service agencies cannot meet the unique needs of all low-income parents. But richer, denser social networks and better connected people, programs and agencies could help. Such networks―supported by digital technologies―have the potential to reduce social isolation, enhance access to goods and services, and provide a platform for new kinds of solutions. #everyoneIn, a United Way Collaboratory, brought together the non-profit, startup, and design communities to develop and pitch solutions that can help young, low income parents thrive by improving access to people, resources, and opportunity through sharing. 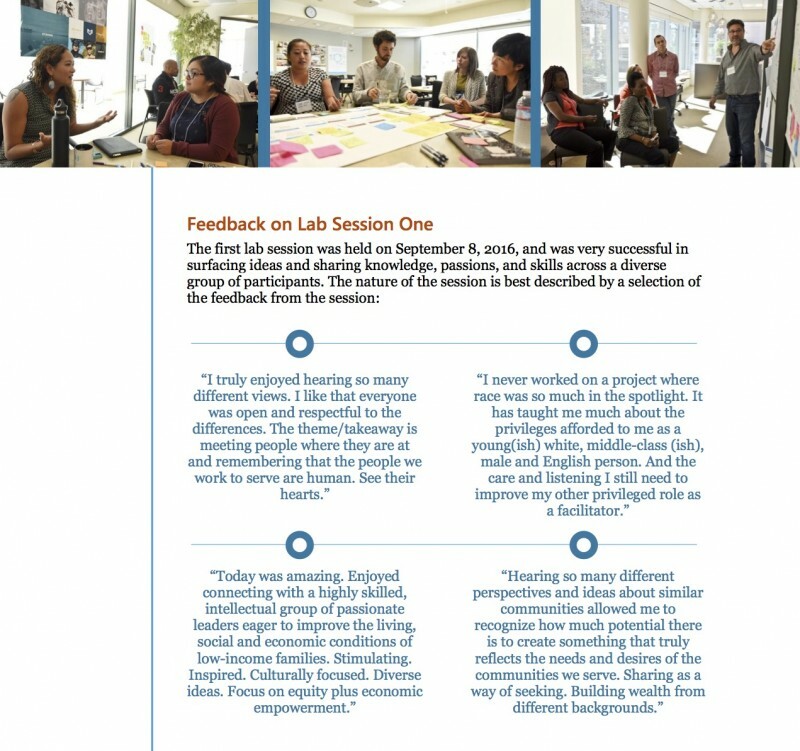 After three design lab sessions, these groups of diverse participants shared their ideas in a community pitch session.